Yodot Android Data Recovery software is an excellent application to recover data from your Android devices from both Android smartphones and Tablet computers. The best feature of the software is that it can recover thousands of installed application files (.apk) along with other media files like music (MP3, WMA, WAV etc), video(AVI, MPG, MOV etc) and pictures(JPEG, GIF, PNG etc). The application helps in recovering lost / deleted files from your android smartphone?s internal storage memory and also from the external storage memory (SD card). The tool identifies and recovers lost data from corrupt, inaccessible and formatted phone card. The application easily runs on all the latest Windows OS such as Windows XP, Windows Vista and Windows 7. 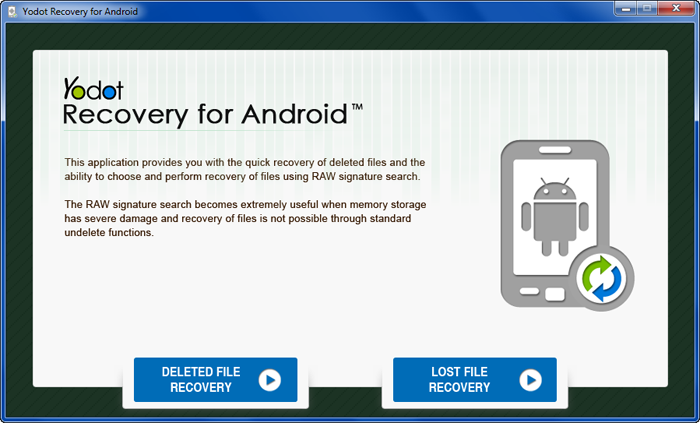 Supports recovery of major Android device manufacturers including Sony, Samsung, HTC, Motorola, LG, Acer, dell etc. The application allows the users to preview the photo file by making use of ?Preview? option, to ensure whether they have selected the right file for recovery. Has the ability to create an exact replica of the SD card, from which files can be recovered if any data loss mishap happens in the future. This site does not contain serial number, crack, keygen Yodot Recovery for Android serial number : serial number is the simplest type of crack. A serial number(cdkey,product key,etc) is register the program as you may already know. a crack or keygen may contain harmful software. If you cannot find the exact version you want, just give it a try. for more information read .nfo/.txt/.diz file include in zipped file.